Home Time Log How to view spent hours by resources for a single day? You can get all the information along with number of hours worked in a particular day from Resource Utilization page. Go to the Filter and Click on the Date to select “Today” or choose any date from “Custom Date” to view number of hours worked for a single day. Go to the Add/Remove column, and check the column for the report you want. For day/date wise resource utilization, select Date, Resource, Hours Spent. The below image shows the spent hours by each resource on April 12. 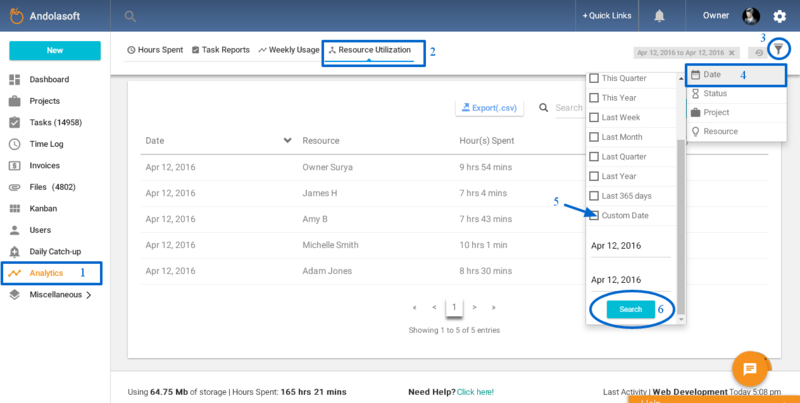 If you have given estimated hours during task creation, then here you can also see the comparison between Hours Spent Vs Estimated Hours of a resource for that day or any date range. You can also filter Resource Utilization by “Project”, “Status” or “Resource”. Note: When you will view the Resource Utilization it will show you the data for the current month.